Digital Marketing specialist’s job role is similar to that of a marketing professional, these specialists have to create brand awareness, promote company’s product and services and coerce prospects to conversions. 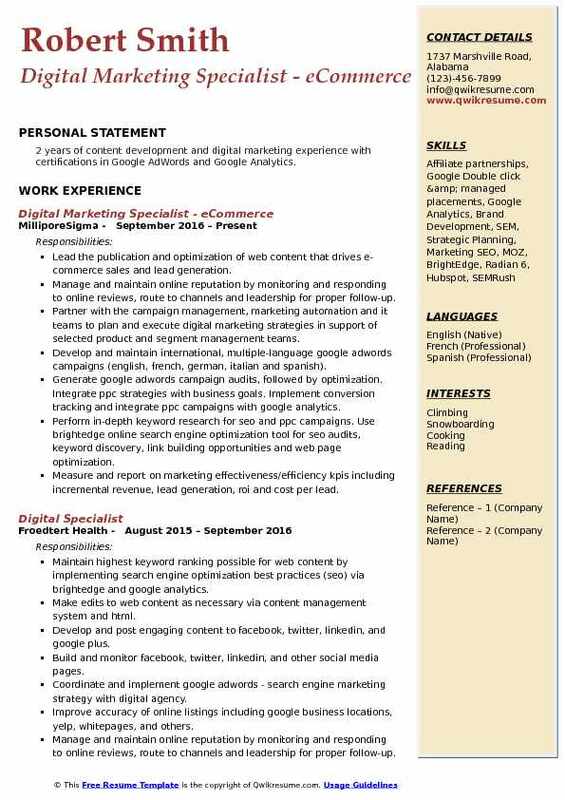 Digital marketing Specialist Resume sample describes the following job responsibilities for the digital marketing specialists – developing online marketing strategies, making online promotions, mailing campaigns, performing customer research online and discovering ways to reach potential customers using various web technologies. To become a digital marketing specialist a person must possess some key skills such as – the flair for marketing, ability to manage time, creative thinking and good presentation skill. Apart from these skills, a digital marketing specialist should be up to date with current digital marketing developments too. 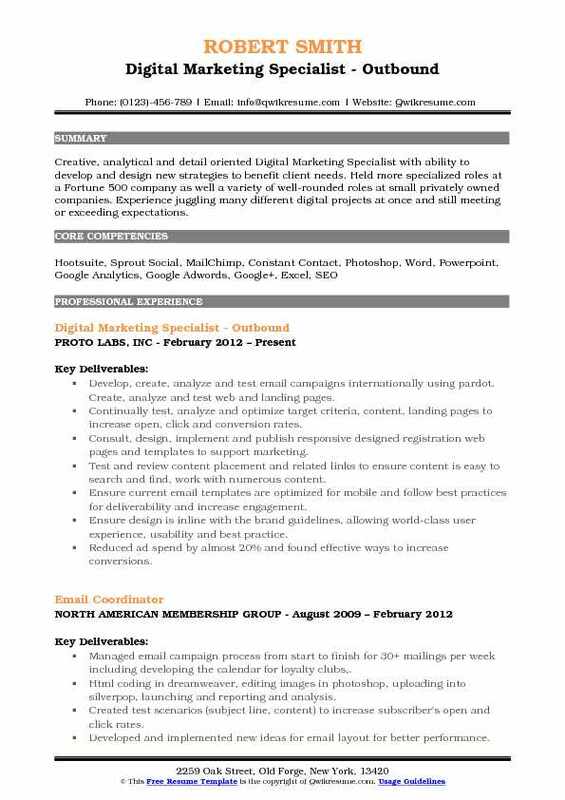 An ideal resume portrays a Graduation or Degree in fields like Marketing or digital media or its relevant field. 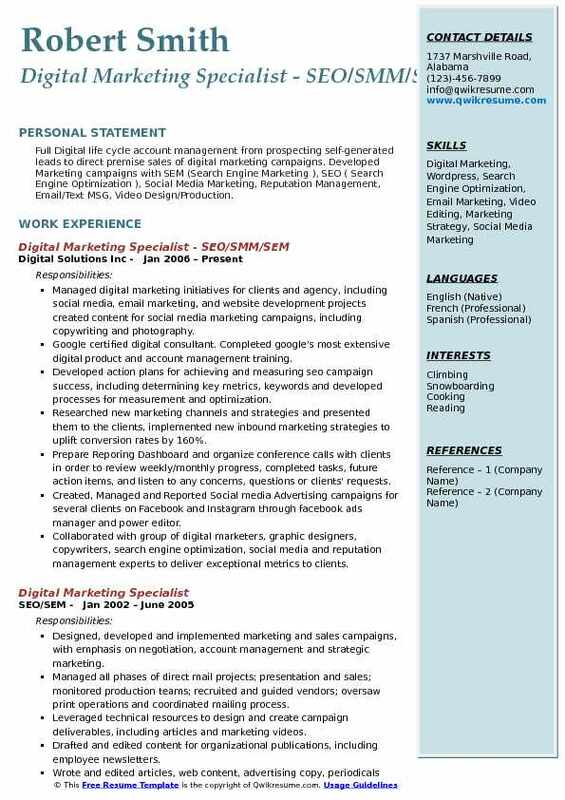 Summary : Marketing professional with a record of successful planning and execution of digital marketing strategies as well as website administration. Highly adaptable with written, creative analysis and problem-solving skills, and a background in diverse corporate environments including direct marketing, financial, retail, and communications industries. Developed and managed digital pay-per-click advertising programs using Google Adwords, Facebook, and third party content distribution networks. Performed monthly adjustments on client accounts/campaigns in Google AdWords and social media channels in order to maximize performance within current budget. Produced monthly performance reports for clients for SEM programs utilizing reporting tools such as Google Analytics; determined key metrics that were of primary importance to clients and provided trending data to compare results month-by-month. Supported business development through the development of comprehensive multi-channel digital advertising programs, written proposals and client presentations based on analysis of prospect's long-term goals and available budget. Implemented SEO strategies for client websites including layout, content optimization, keyword structuring, etc. Assisted in providing ROI analysis of clients digital marketing campaigns. Proven understanding and implementation of pay-per-click, search engine optimization, google analytics and data analysis. 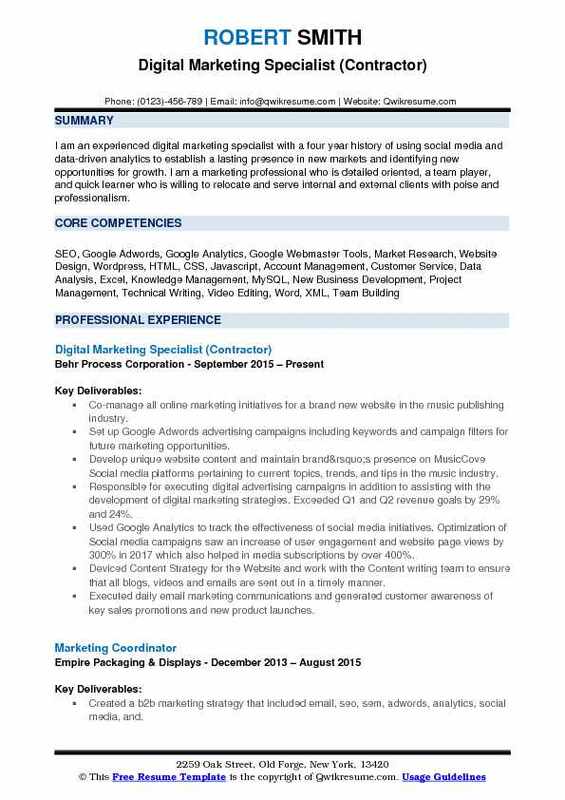 Objective : I am an experienced digital marketing specialist with a four year history of using social media and data-driven analytics to establish a lasting presence in new markets and identifying new opportunities for growth. I am a marketing professional who is detailed oriented, a team player, and quick learner who is willing to relocate and serve internal and external clients with poise and professionalism. Co-manage all online marketing initiatives for a brand new website in the music publishing industry. Set up Google Adwords advertising campaigns including keywords and campaign filters for future marketing opportunities. Develop unique website content and maintain brand’s presence on MusicCove Social media platforms pertaining to current topics, trends, and tips in the music industry. Responsible for executing digital advertising campaigns in addition to assisting with the development of digital marketing strategies. Exceeded Q1 and Q2 revenue goals by 29% and 24%. Used Google Analytics to track the effectiveness of social media initiatives. Optimization of Social media campaigns saw an increase of user engagement and website page views by 300% in 2017 which also helped in media subscriptions by over 400%. Deviced Content Strategy for the Website and work with the Content writing team to ensure that all blogs, videos and emails are sent out in a timely manner. Executed daily email marketing communications and generated customer awareness of key sales promotions and new product launches. 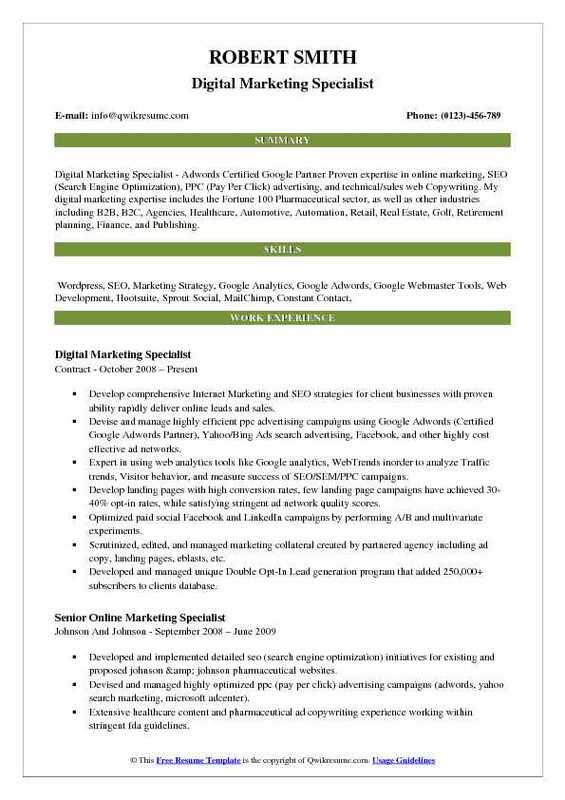 Summary : Digital Marketing Specialist - Adwords Certified Google Partner Proven expertise in online marketing, SEO (Search Engine Optimization), PPC (Pay Per Click) advertising, and technical/sales web Copywriting. My digital marketing expertise includes the Fortune 100 Pharmaceutical sector, as well as other industries including B2B, B2C, Agencies, Healthcare, Automotive, Automation, Retail, Real Estate, Golf, Retirement planning, Finance, and Publishing. Develop comprehensive Internet Marketing and SEO strategies for client businesses with proven ability rapidly deliver online leads and sales. Devise and manage highly efficient ppc advertising campaigns using Google Adwords (Certified Google Adwords Partner), Yahoo/Bing Ads search advertising, Facebook, and other highly cost effective ad networks. Expert in using web analytics tools like Google analytics, WebTrends inorder to analyze Traffic trends, Visitor behavior, and measure success of SEO/SEM/PPC campaigns. Develop landing pages with high conversion rates, few landing page campaigns have achieved 30-40% opt-in rates, while satisfying stringent ad network quality scores. Optimized paid social Facebook and LinkedIn campaigns by performing A/B and multivariate experiments. Scrutinized, edited, and managed marketing collateral created by partnered agency including ad copy, landing pages, eblasts, etc. Developed and managed unique Double Opt-In Lead generation program that added 250,000+ subscribers to clients database. Summary : Over 20 years of web technology experience. 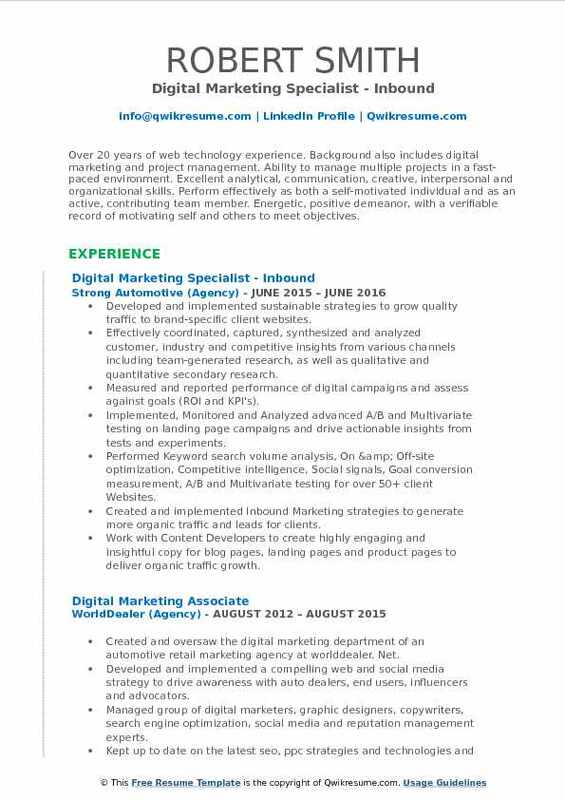 Background also includes digital marketing and project management. Ability to manage multiple projects in a fast-paced environment. Excellent analytical, communication, creative, interpersonal and organizational skills. Perform effectively as both a self-motivated individual and as an active, contributing team member. Energetic, positive demeanor, with a verifiable record of motivating self and others to meet objectives. Developed and implemented sustainable strategies to grow quality traffic to brand-specific client websites. Effectively coordinated, captured, synthesized and analyzed customer, industry and competitive insights from various channels including team-generated research, as well as qualitative and quantitative secondary research. Measured and reported performance of digital campaigns and assess against goals (ROI and KPI's). Implemented, Monitored and Analyzed advanced A/B and Multivariate testing on landing page campaigns and drive actionable insights from tests and experiments. Performed Keyword search volume analysis, On & Off-site optimization, Competitive intelligence, Social signals, Goal conversion measurement, A/B and Multivariate testing for over 50+ client Websites. Work with Content Developers to create highly engaging and insightful copy for blog pages, landing pages and product pages to deliver organic traffic growth. Summary : Full Digital life cycle account management from prospecting self-generated leads to direct premise sales of digital marketing campaigns. Developed Marketing campaigns with SEM (Search Engine Marketing ), SEO ( Search Engine Optimization ), Social Media Marketing, Reputation Management, Email/Text MSG, Video Design/Production. Managed digital marketing initiatives for clients and agency, including social media, email marketing, and website development projects created content for social media marketing campaigns, including copywriting and photography. Google certified digital consultant. Completed google's most extensive digital product and account management training. Developed action plans for achieving and measuring seo campaign success, including determining key metrics, keywords and developed processes for measurement and optimization. Researched new marketing channels and strategies and presented them to the clients, implemented new inbound marketing strategies to uplift conversion rates by 160%. Prepare Reporing Dashboard and organize conference calls with clients in order to review weekly/monthly progress, completed tasks, future action items, and listen to any concerns, questions or clients' requests. Created, Managed and Reported Social media Advertising campaigns for several clients on Facebook and Instagram through facebook ads manager and power editor. Collaborated with group of digital marketers, graphic designers, copywriters, search engine optimization, social media and reputation management experts to deliver exceptional metrics to clients. 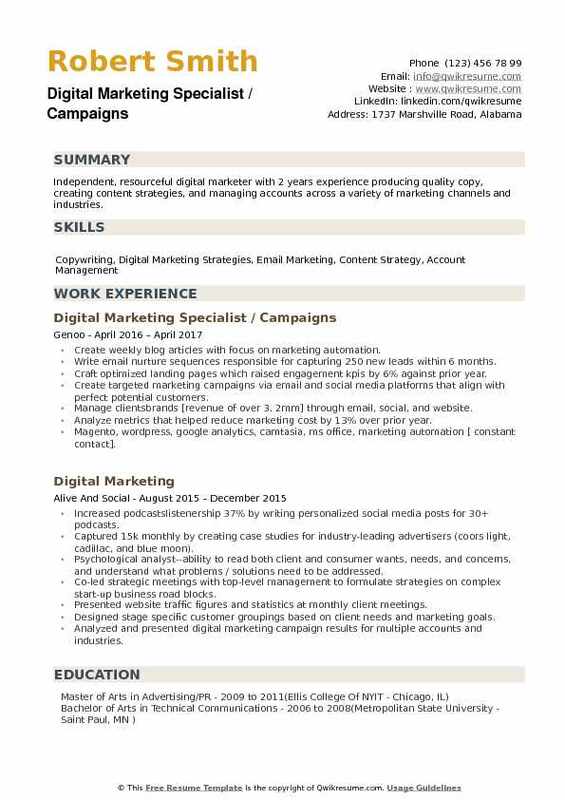 Objective : I am eager to obtain a challenging position in Digital Marketing at a company where I can grow and utilize my creative problem solving skills, work experience, and education while maximizing the company's revenue and market share. Utilize Zdirect and Salesforce Marketing Cloud, Email platforms for development work, list management, select data segmentation, deliverability and distribution of email, sms, and push notifications. Develop content for promotional campaigns for email, mobile, online media, and other digital solutions. Developed monthly email marketing schedules based on previous campaign performance and market trends. Build targeting strategies and audience segments to optimize campaign performance across channels. Partner with Brand & Communications, Sales & Marketing, Product teams and Legal to plan and deliver efficient, effective digital campaigns. Search for new opportunities on CVB and Affiliate websites, negotiate and buy appropriate media. Monitor and study email conversion rates based on time/day and targeted audience to create personalized email campaigns to boost open rates. Summary : A highly skilled, dynamic and focus-driven professional with over 10 years of experience, and a strong record of achievement in providing the necessary strategic marketing expertise to ensure streamlined operations, client satisfaction, significantly increased corporate expansion, proficiency and profitability. Developed and oversaw targeted, out-of-the-box public relations and digital marketing strategies for multiple clients resulting in community relationship building, new business development, media placements, cross-promotions, and substantial sales increase. Built relationships with bloggers, traditional media and community with multiple positive media placements in print, online and television; increased positive brand awareness in community. Presented information and consulted on strategic social media marketing including facebook, twitter, linkedin, and pinterest. Managed all clients' social media presence resulting in successful creation of social media presence and expansion of fans, likes, rt's, and pins. Managed national ppc lead generation digital campaigns, including initial planning, implementation, monitoring, optimization, analysis and reporting. Helped implement new customer funnel, leading to 12 new business customers in one-week period. The previous funnel landed one new customer in previous 20 days. Developed an entire search engine optimization plan for new website launching in fall of 2017 to help grow traffic to website as well as grow brand recognition. 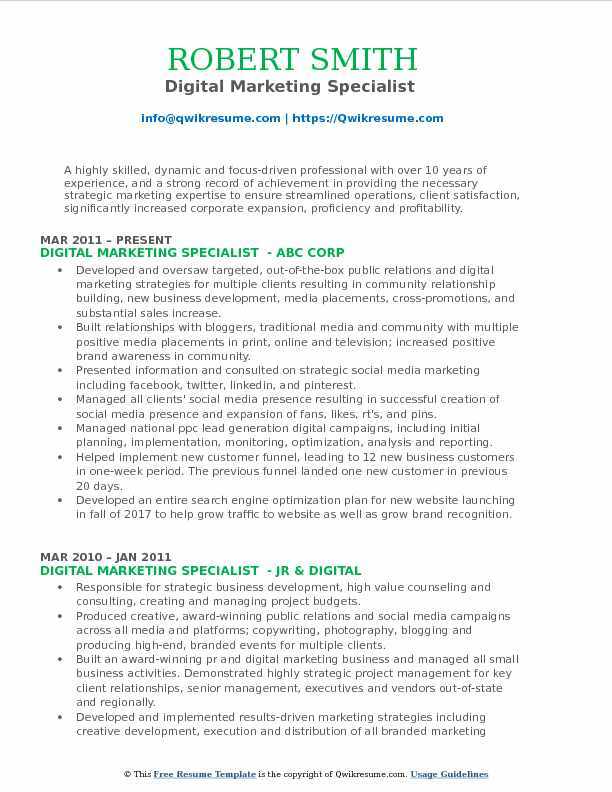 Objective : Creative, analytical and detail oriented Digital Marketing Specialist with ability to develop and design new strategies to benefit client needs. Held more specialized roles at a Fortune 500 company as well a variety of well-rounded roles at small privately owned companies. Experience juggling many different digital projects at once and still meeting or exceeding expectations. Develop, create, analyze and test email campaigns internationally using pardot. Create, analyze and test web and landing pages. Continually test, analyze and optimize target criteria, content, landing pages to increase open, click and conversion rates. Consult, design, implement and publish responsive designed registration web pages and templates to support marketing. Test and review content placement and related links to ensure content is easy to search and find, work with numerous content. Ensure current email templates are optimized for mobile and follow best practices for deliverability and increase engagement. Ensure design is inline with the brand guidelines, allowing world-class user experience, usability and best practice. Reduced ad spend by almost 20% and found effective ways to increase conversions. 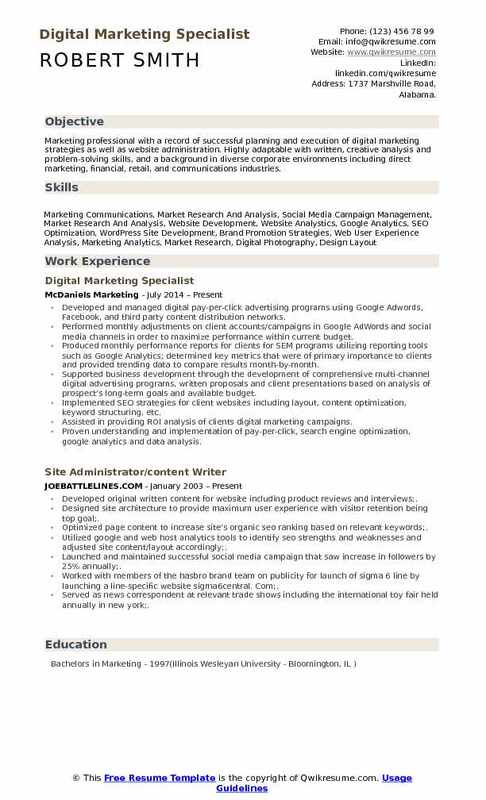 Objective : 2 years of content development and digital marketing experience with certifications in Google AdWords and Google Analytics. Lead the publication and optimization of web content that drives e-commerce sales and lead generation. Manage and maintain online reputation by monitoring and responding to online reviews, route to channels and leadership for proper follow-up. Partner with the campaign management, marketing automation and it teams to plan and execute digital marketing strategies in support of selected product and segment management teams. Develop and maintain international, multiple-language google adwords campaigns (english, french, german, italian and spanish). Generate google adwords campaign audits, followed by optimization. Integrate ppc strategies with business goals. Implement conversion tracking and integrate ppc campaigns with google analytics. Perform in-depth keyword research for seo and ppc campaigns. Use brightedge online search engine optimization tool for seo audits, keyword discovery, link building opportunities and web page optimization. Measure and report on marketing effectiveness/efficiency kpis including incremental revenue, lead generation, roi and cost per lead. 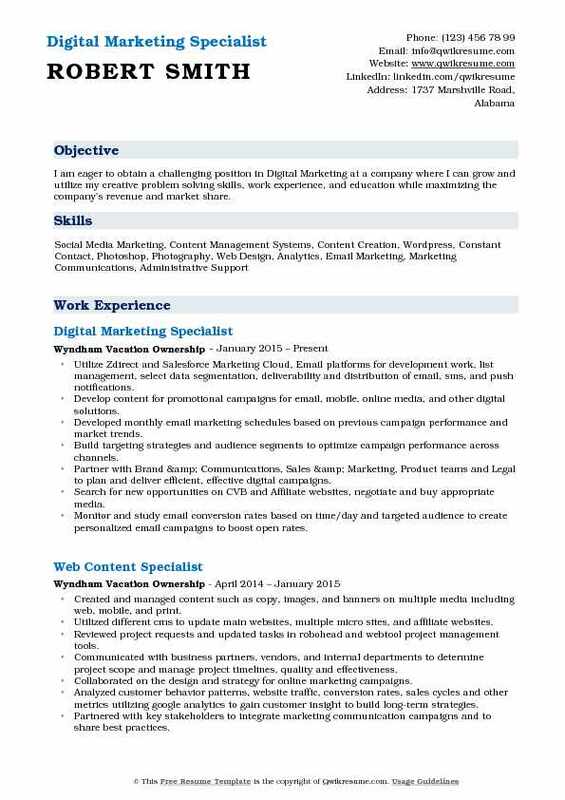 Objective : Independent, resourceful digital marketer with 2 years experience producing quality copy, creating content strategies, and managing accounts across a variety of marketing channels and industries. Create weekly blog articles with focus on marketing automation. Write email nurture sequences responsible for capturing 250 new leads within 6 months. Craft optimized landing pages which raised engagement kpis by 6% against prior year. Create targeted marketing campaigns via email and social media platforms that align with perfect potential customers. Manage clientsbrands [revenue of over 3. 2mm] through email, social, and website. Analyze metrics that helped reduce marketing cost by 13% over prior year. Magento, wordpress, google analytics, camtasia, ms office, marketing automation [ constant contact].